Carlson's new line of steel shot choke tubes pattern steel shot extremely well. 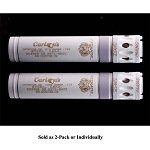 These choke tubes feature a longer parallel section allowing for less flyers and denser patterns. 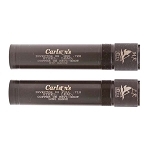 These choke tubes extend 3/4 " outside the barrel eliminating damage to your barrel caused by prolonged steel shot use. The longer parallel section allows for use of larger steel shot in tighter choke constrictions. They are made of 17-4 stainless with a knurled extension and a blue finish. 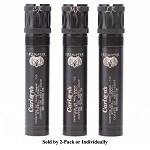 Each choke tube carries a lifetime warranty. All steel shot sizes may be used in the close and mid-range choke tubes. Do not use steel faster than 1550 FPS or steel shot sizes larger than BB through the Long Range choke tube. 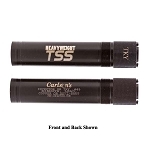 Close Range Extended Steel Shot Choke Tubes - for hunting over decoys, throws tightest pattern up to 35 yards. 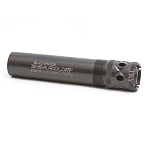 Mid Range Extended Steel Shot Choke Tubes - for those situations where you are shooting 25 to 40 yards. Extended Range Steel Shot Choke Tubes - for taking shots 40 yards and up. 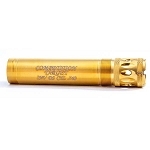 Our best patterning long range choke tube.